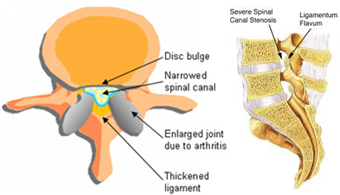 Lumbar spine canal stenosis is typically associated with low back pain, and diffuse leg pain, either one-sided or in both legs. It is sometimes implicated when there is pain in the calf muscle after walking (claudication), and relieved within 15 to 20 minutes of rest, or by bending over. It is of critical importance to note, however, that numerous studies have demonstrated that the aforementioned symptoms are frequently found in the absence of spinal canal stenosis. Conversely, canal stenosis is a frequent radiographic finding in the asymptomatic patient. 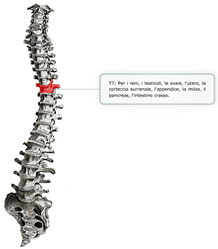 Stenosis can be central (spinal canal), or lateral (intervertebral foramina). Stenosis can be caused by enlarged cartilaginous tissue of the spinal canal, degeneration of bone, bony outgrowths (osteophytes), or herniated discs. A normal central canal is said to be 15mm or greater while 10mm is regarded as absolute stenosis. MRI is more valuable with soft tissue stenosis while CT is generally reserved for suspicion of bony canal stenosis. As mentioned previously, the findings of spinal canal stenosis on an MRI or CT do not mean that the cause of a person’s symptoms have been determined. Low back and leg pain can have many causes, and most of the time, they are completely unrelated to the diameter of the spinal canal. As a Chiropractor with extensive training in radiology, Dr. Morrison, is adept at determining the clinical relevance of such findings (MRI, CT, x-rays, etc.). Once the precise causes of patient symptoms has been discovered, accurate therapy is provided for lasting relief. With improved alignment of the spinal column, patients feel less rigid and able to walk longer distances. Symmetry and strength is then maintained with home exercises and periodic Chiropractic care.